There are countless products on the market today. If you want something, chances are high that there is a company that makes it. And when there are several companies that produce the same items, it can get confusing. Who do you choose? Who will give you the best product at the best price? At Volt Industrial Plastics, we strive to earn your business by doing our best and creating products that are durable and manufactured using the best techniques. Here are a few other reasons why we believe Volt is the number one choice when it comes to buying your clips, clamps, and other custom fasteners. Today’s technology has made a lot of things easier. You can look up information, share pictures and videos with family, and purchase almost anything you can think of online and have it shipped straight to your door. Because of this, people are accustomed to having their items shipped and received in a short amount of time. Whether you need an item that is in stock or a product that has to be manufactured, you don’t have to worry about lengthy turn-around times with Volt Industrial Plastics. We have over 100 million parts in stock that can be shipped to you the same day. And if you need a part that is not in stock, you are looking at about a 3-5 day lead time. Many of our top competitors may be able to produce some of the same products we sell. However, you may be waiting 6-12 weeks to receive your order. There are a variety of industries that rely on fasteners for their products, their services, and/or their day-to-day duties. Whether you want your fasteners to be the perfect shade of white to match an appliance or you need a bright neon orange to help the fastener stand out, Volt can do it. 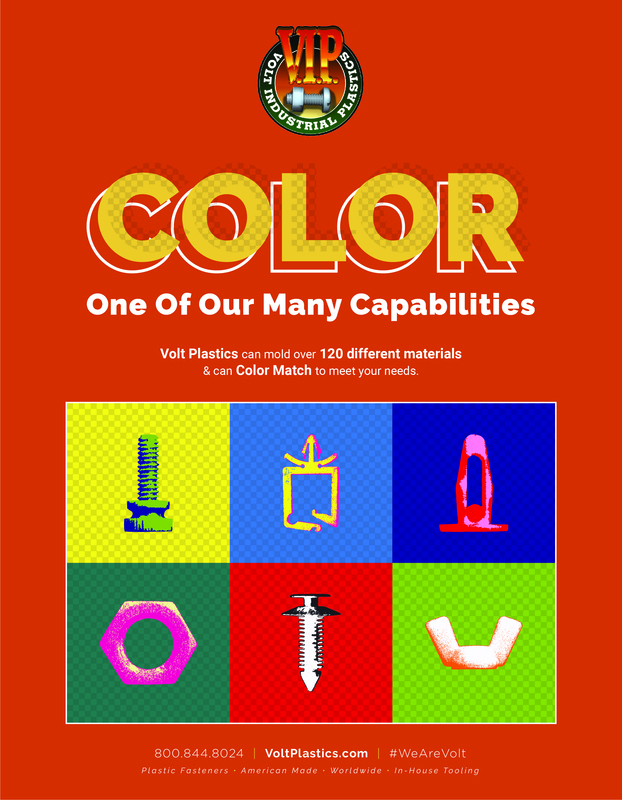 Volt Industrial Plastics uses the best in color matching technology to get the color you need. Our color-matched fasteners are great for those who need simple solutions for safety or keeping items organized. They are also great for those who need a screw or rivet to match other manufacturer parts and panels. YOU DREAM IT. VOLT INDUSTRIAL PLASTICS CAN MAKE IT. There is no doubt that we live in a time of innovation. Each day, thousands of people are inventing new things or looking to make existing items better. When you are creating something new, you may find yourself needing parts that you can’t find in stores or through other manufacturers. At Volt Industrial Plastics, we have state-of-the-art technology to build prototypes to customer specs. In addition to the skills of our machines and our craftsmen, Volt also has a wide range of materials to choose from when putting together your custom fastener. We can create fasteners that glow, have a rich color, and feel soft to the touch. We can even create a plastic clip that gives off a pleasing scent. 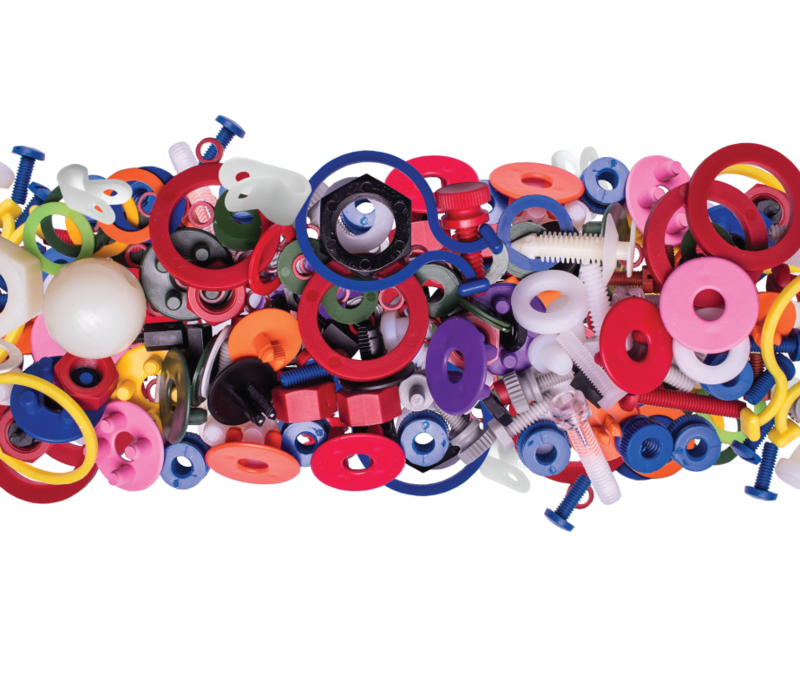 The manufacturing possibilities are truly endless with Volt Industrial Plastics. There are many other companies out there that provide some of the same products that we do. However, our customer service is second to none. In fact, our customer service is what sets us apart from our competition. Whether you need to work with our team to produce custom items specific to your brand or you have a question about a part we keep in stock, our entire team is dedicated to providing the best customer service. 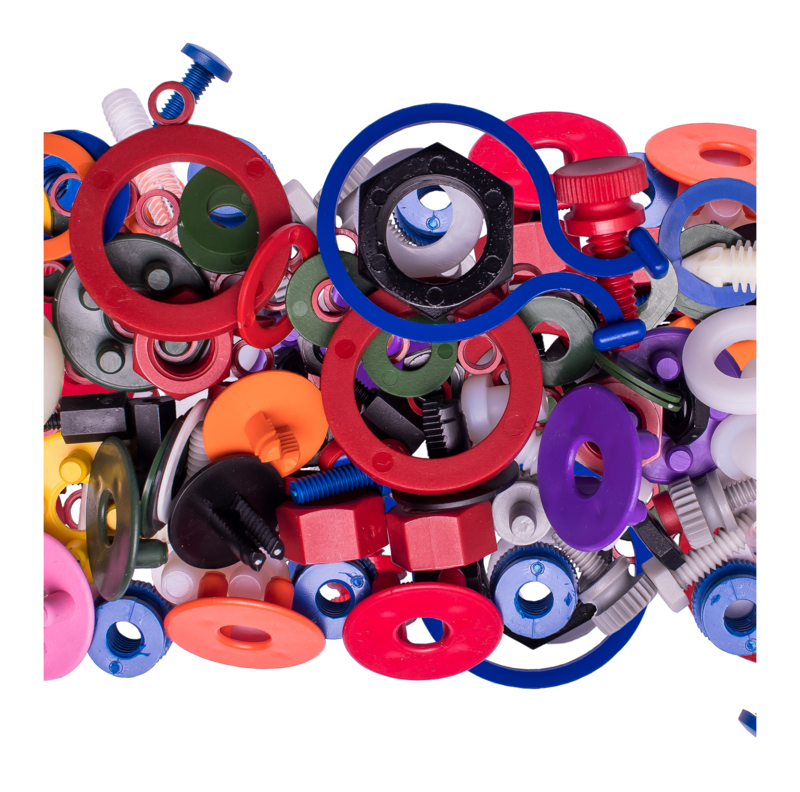 From our rapid response production capability to our ability to manufacture custom fasteners, Volt Industrial Plastics is ready to show you how we are different. Whether it’s a screw, rivet, dowel, clip, or clamp, Volt can get you the fasteners you need.